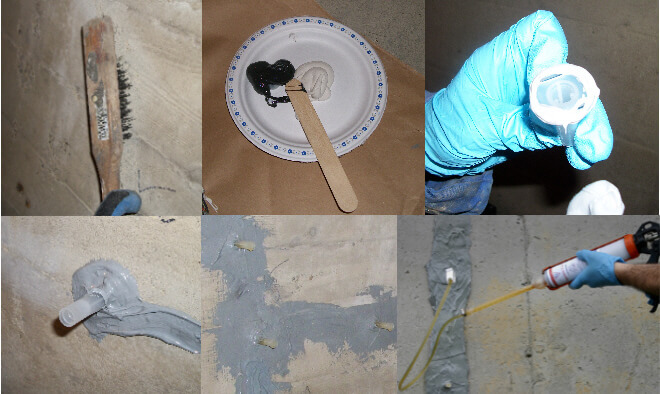 The secret to effective low-pressure crack injection for basement wall crack repair - using either epoxy or polyurethane foam - is gradual introduction of the liquid polymer into the crack at low pressures (20 to 40 psi). 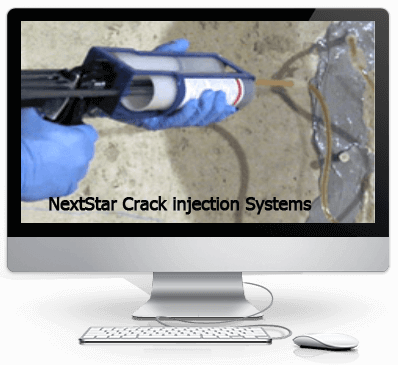 This method requires some patience, but it allows the applicator to monitor the injection process and ensure that the crack is completely filled. 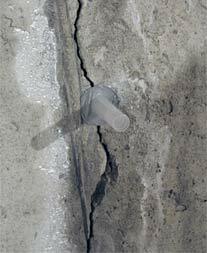 Incomplete injection of a crack is the most common reason for crack repair failure. To fill a typical concrete crack in a residential foundation wall, injecting at pressures above 40 PSI may not be effective. Liquids prefer to take the path of least resistance. At higher pressures, the liquid has enough force to and rise up the crack without filling the backside of the crack which is often narrower than the front of the crack. The applicator can only determine how the crack is being filled by watching the progress of the liquid traveling from port to port. At pressures under 40 psi, the liquid epoxy or urethane can only get to the port above it by first filling to the back of the crack and then rise as it fills the concrete wall crack. 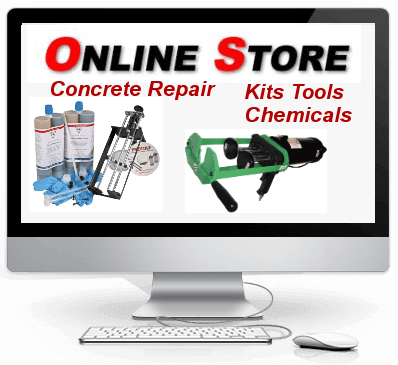 As a consequence, when the applicators see material coming out of the respective port above or adjacent to the port being filled, he (or she) knows that the basement wall crack is filled with product up to that point. At pressures greater than 40 PSI, the liquid can overcome gravity and reach the port adjacent to the one being filled without filling small sections of the wall crack. 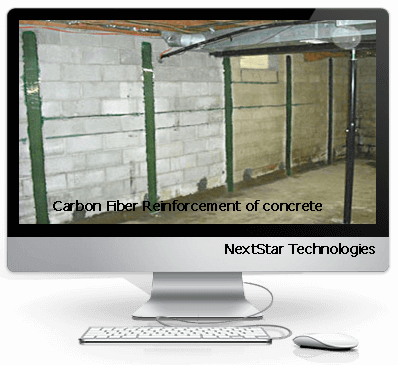 The following is a basic guide for structural repairs and waterproofing procedure for poured foundation cracks. 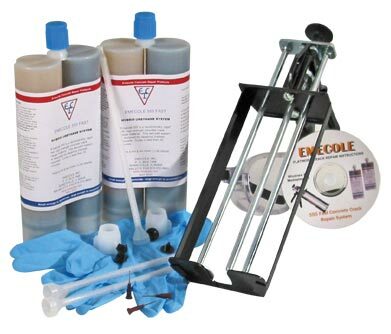 The methods of repair have been compiled from several professionals throughout north america who utilize epoxies and polyurethanes for reconstruction. Remove loose or flaking concrete with a wire brush or sand blast the surface to ensure proper bond of the surface seal paste. Always wipe the surface prior to applying surface seal no matter what method of removal is used (i.e. power washing, sand blasting, wire brushing, scraping, etc). 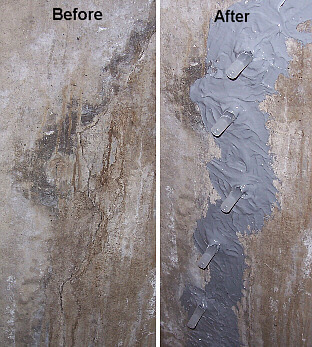 Surface ports are most commonly used for low-pressure injection into concrete wall cracks. Mix a small amount of the surface seal and apply to flange portion of the surface port being careful not to cover hole. A small amount is needed to tack the port in place. Place surface port directly over crack and press firmly to ensure good bond. The ports are placed 8-10 inches apart on 10-inch width concrete. Corner ports can be used for wider foundation cracks or in corners where surface ports cannot be utilized. Specialized corner ports are also a viable approach for hard-to-reach corners. Surface ports eliminate the chore of drilling into the concrete, reducing labor, time and clean-up. 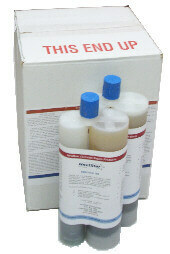 Use Epoxy surface seal paste to seal over the surface ports and exposed cracks. The paste is formulated to cure in anywhere from 10 minutes to three hours. The more paste that is mixed at one time, the faster it will cure. Mix in small amounts to avoid waste. The fast setting paste gives an excellent surface seal with high bond characteristics which allows injection easily at 20-40 PSI pressures. The entire exposed crack should be covered with surface seal leaving only the port hole uncovered. The seal paste should extend one to two inches on either side of the crack and feathered edged to reduce seepage. The surface seal paste is cured and ready for injection when you cannot make an impression in it with your fingernail. If the concrete is cool, mix a portion of the surface seal paste and apply it in thicker layers to cure faster. In any case, do not begin injection until surface seal resists your fingernail. Structural cracks move when concrete goes through a temperature cycle, which occurs normally over a 24 hour period. Surface seals will frequently crack from movement if not restrained by epoxy injection. This condition requires the scheduling of injection within six hours after sealing the crack. After the crack has been sealed and the injection ports installed it is a good idea to flush waterinto the ports to clean out the crack and prepare for injection of Polyurethane.Water flushed through the wall will not affect Epoxy injections and is a simple test to see how well the repair was sealed up as you do not want to lose product from a leak.Some of our products can be dispensed with a standard calking gun and others require a dual tube injection gun supplied in the more advanced kits. Inject at 20-40 PSI into the lowest port on the wall until the epoxy or urethane begins to flow from the port above it. Plug the first bottom port with a cap provided and move up to the next port, repeating this procedure until the entire crack has been filled with the epoxy or polyurethane. Epoxy should be topped up after 20 min or so to replace any epoxy that has leaked out to the outside. 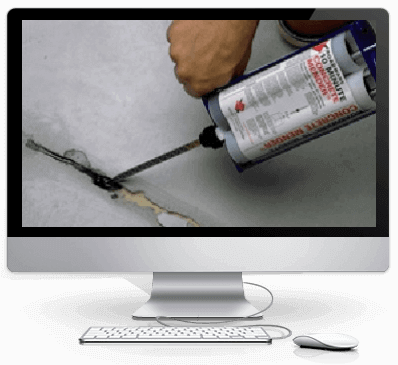 Wide cracks will accept epoxy or urethane foam freely and do not require high pressure. Tight cracks, however, also require slow, continuous pressure of 20-40 PSI to reduce the possibility of leaks or blow-outs. If you feel pressure building within the cartridge, allow time for the material to seep into the crack before applying additional pressure. Remember, liquids cannot be compressed and need time to penetrate the crack. 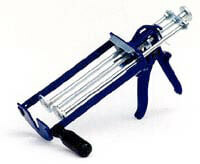 Let the compression spring on the “Jake” dispensing tool push the material into the crack. Pump the trigger mechanism only as required to keep the compression spring actuated. Hairline cracks will require special care. Hairline cracks will accept a smaller volume of epoxy in a given period of time but will penetrate a larger area of crack surface. Patience is required to effectively seal a hairline crack. The injection ports can be removed after 24 to 48 hours at room temperature when using epoxies; one to two hours with urethane foam. This allows adequate time for the epoxy or urethane foam to cure and penetrate into the cracks. The ports can be removed by striking with a trowel or hammer. If cosmetic appearance is preferred, the surface seal can be chipped, ground (with sanding disk), or burned off. The surface seal is paintable if grinding is not desired. Wear protective clothing and breathing apparatus while grinding. If cosmetic appearance is preferred, the surface seal can be chipped or grounded off (with sanding disk). To save time of grinding or chipping off the surface seal, NextStar offers a removable surface seal, 322 Seal-n-Peel Surface Seal. It easily removes from the top in one easy step, leaving an almost invisible repair job.